The great conservationiost, wilderness lover and mountaineer John Muir died on December 24th, 1914. At the beginning of this centenary year I wrote the following appreciation of him for The Great Outdoors. This year is the centenary of the death of John Muir, arguably the most influential defender of wild places ever and whose legacy is still relevant and important today. Born in Dunbar in Scotland, Muir emigrated to the USA when he was eleven and lived there the rest of his life. He's still not that well-known in Britain, unlike the USA, where he is regarded as the 'father of National Parks'. In Martinez in California where he settled there are John Muir roads and businesses and the house where he lived is now the John Muir National Historic Site. The Sierra Club, which Muir founded in 1892, is one of the USA's leading conservation organisations and does much to keep Muir's memory alive. Scotland is slowly catching up with John Muir'sBirthplace, a statue of the young Muir and the John Muir Country Park in Dunbar plus the 73 kilometre John Muir Way along the East Lothian coast. And of course there is the John Muir Trust, founded in 1983 to campaign for wild land. I discovered Muir many years ago, not with a sudden revelation but slowly as I came across the name again and again and he seeped into my consciousness. I didn't really pay him much attention though until I hiked the Pacific Crest Trail, which in the High Sierra in California runs through the John Muir Wilderness and follows the John Muir Trail (which must be one of the most beautiful backpacking routes in the world). Just who was this John Muir who was so clearly important I wondered. From signs and leaflets and talking to other hikers I began to learn a little about the man. 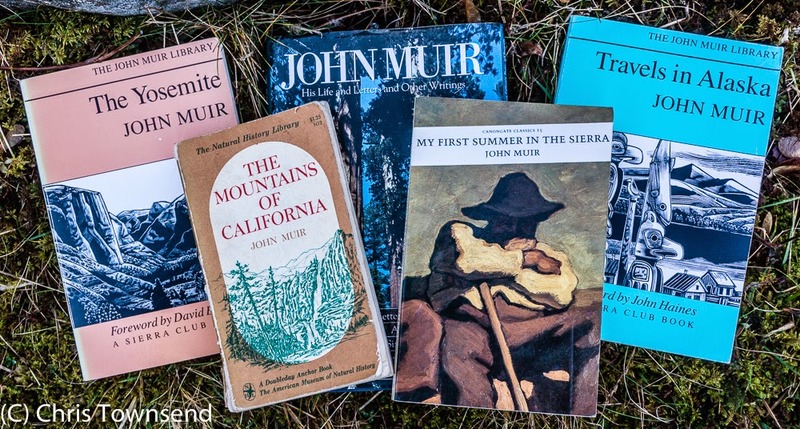 A few years later I came across a second-hand copy of The Mountains of California (books by Muir were hard to find in the 1980s) and began to read Muir's own words. Immediately I was taken with his passion and devotion to nature and wild places. I went on to read his other works, some several times. The language can be flowery for modern tastes in places but his eye for detail and his love of everything natural shine through. (I'd recommend My First Summer In The Sierra as a first book to read - all of them are available on the Sierra Club website). I also read books about Muir, wanting to know more about this iconic figure. 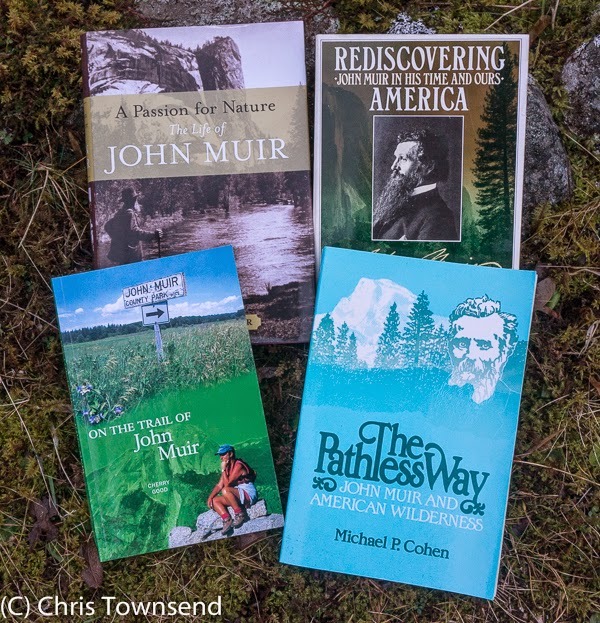 I think the best of these is Michael P. Cohen's The Pathless Way: John Muir and American Wilderness, which goes more deeply into Muir's dilemmas and contradictions than other biographies. Muir is to be admired not just as a conservationist, not just for his love of nature, key though these are to his greatness, but also for his outdoor adventures and experiences. Long before any of the equipment we take for granted, or the guidebooks, maps and paths, Muir would head off into the wilderness on long solo treks and climbs. From a boy scrambling on the cliffs and castle walls of Dunbar to the adult mountaineer making a daring first ascent of Mount Ritter deep in the High Sierra (a climb described superbly in The Mountains of California) Muir revelled in exploring wild places. He didn't just look at them or study them he went into them - climbing trees in a storm, edging out on narrow ledges to look down a waterfall, climbing rock faces, crossing glaciers, sleeping out wrapped in a coat (his minimal equipment makes today's ultralight backpackers look burdened down). He walked long distances as well - A Thousand-Mile Walk To The Gulf describes his journey from Indianpolis to the Gulf of Mexico in 1867. And when he arrived in California a year later he walked from San Francisco to Yosemite Valley. There followed many trips into the then still little-known Sierra Nevada mountains and in later years further afield, especially Alaska (as told in Travels in Alaska). Much has been and will be written and said about John Muir. What should be remembered is that his vision of the necessity of wildness and nature is as valid now as it was 100 years ago. I think you mean he died in 1914! Oops! Thanks. I've changed it. I recently read 'The Wisdom of John Muir' by Anne Rowburn, a collection of a 100 or so writings by him. I still feel his words are immensely powerful even after 100 years. The planet needs more like him. After completing the JMT this summer I can only agree on the beauty of the Sierras. Great post Chris.